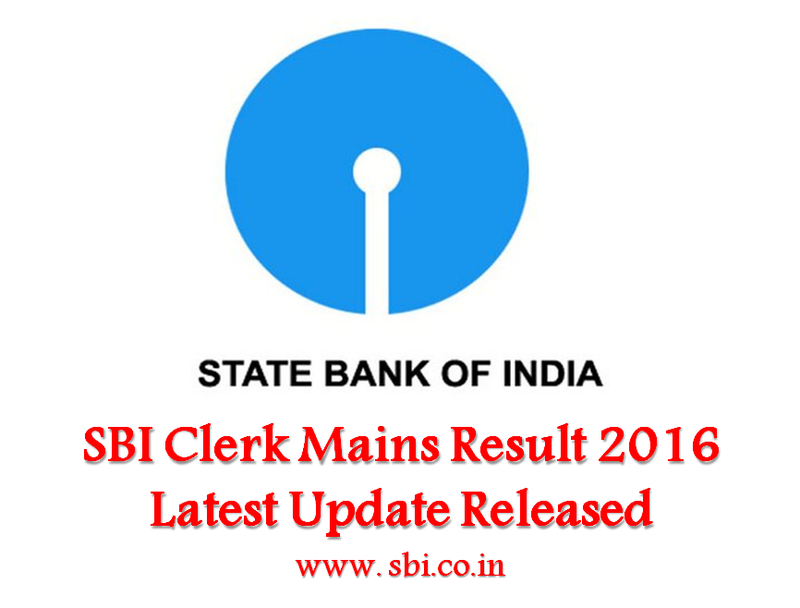 SBI Clerk Mains Result 2016: As of now no official update has been released in this regard by State Bank of India. Candidates have been waiting anxiously for the result, which was supposed to be released towards the end of August. Candidates are suggested to check for latest updates at the official portal of SBI (sbi.co.in) regarding the result of Junior Associate (JA) and Junior Agricultural Associate (JAA) posts. It has been more than two months since the completion of the examination and the delay has increased the agony of the candidates. SBI had notified about 17000+ vacancies in Junior Associate (JA) and Junior Agricultural Associate (JAA) posts. An overwhelming response was received in this regard. The examination was held in two phases: preliminary and main. The preliminary examination was held in the month of May and the main examination was held during June. Near about 3 lakh candidates had qualified the preliminary exam and had been declared eligible to appear for the main examination. Candidates those who qualify will be appointed against the 17000+ vacancies available for the posts of Junior Associates (customer support and sales) and Junior Agricultural Associates. The Main exam was held for those candidates who had qualified the preliminary examination, the result of which was declared on 17 June. What’s next after SBI Clerk Mains Result declaration? After the declaration of the SBI clerk mains result 2016, only those candidates who have qualified it will be eligible to appear for the Phase 3 selection process. Qualified candidates will be placed according to their marks in descending order in respective categories. Depending upon the number of vacancies only certain number of candidates from amongst those who qualify by ranking high enough in the merit will be called for interview in the ratio of maximum 3 candidates for each vacancy. Candidates are required to score a minimum percentage marks (to be decided by the bank) in interview to be considered for final selection. 5% relaxation for SC/ST/ OBC/PWD/XS category will be available thereon. In addition to this, candidates will also appear for a test of official and/or local language. Those who produce 10th standard mark sheet/certificate evidencing having studied official (local) language will not be subjected to any Language test. In case of others, language test will be conducted at the time of interview (if interview is held) /before final selection (if interview is not held). Candidates not found to be proficient in official and/or local language would be disqualified. SBI follows strict selection procedure for sorting out eligible candidates. The marks obtained in the Preliminary Examination will not be added for the selection. Only the marks obtained in Main Examination (Phase-II) will be added to the marks obtained in Interview (Phase-III) (if interview is held) for preparation of the final merit list. Final selection will be made on the basis of candidate's performance in the test (main examination) and interview (if interview is held) taken together. Results of the candidates who have qualified for Interview and the list of candidates finally selected will be made available on the Bank's website. Final select list will also be published in Employment News/ Rozgar Samachar. Though exactly not ascertained, the expected cut off marks for SBI Clerk Main exam 2016 can be between 140-145. While the general/ financial awareness questions were easy, other sections were of moderate difficulty level. Candidates should note that the figures regarding expected cut off marks are for reference purpose. The original marks can vary from this one.